Anti-Semitism in Ukraine: How many "chief rabbis" does the country have? Moshe-Reuven Asman is one of them. On one side, there’s Moshe Reuven Asman, who caused quite a bit of international consternation with his call for Kiev’s Jews to “leave the city center or the city all together and if possible the country too” amid fears that Jews would be targeted in the country’s chaos. But there’s also Yaakov Dov Bleich, who has accused Russia of staging anti-Semitic provocations to justify its invasion of Crimea. This has been an issue for a while in Ukraine, where at least three men claim the title of “chief rabbi.” As the Jerusalem Post reported in 2005, Asman was elected that year by two Jewish organizations, the All-Ukrainian Jewish Congress and the United Jewish Community of Ukraine, but his election was rejected as illegitimate by a number of other groups. The U.S.-born Bleich, a member of the Karlin-Stoliner Hasidic dynasty and the president of the Jewish Federation of Ukraine, has been referred to as chief rabbi since 1992 . There’s also the Russian-born Azriel Haikin, who was proclaimed chief rabbi in 2003 by “dozens of Chabad rabbis” working for the Federation of Jewish Communities. He seems to be keeping his head down in the current unrest. Then there are also other figures, including Alex Dukhovny, head rabbi of the Ukrainian Progressive Judaism communities, and Reuven Stamov, head rabbi of the Ukrainian Traditional Judaism communities, both of whom are signatories of an open letter to Vladimir Putin, which circulated this week, asking him to stop using the protection of Jews as a pretext for invading Ukraine. 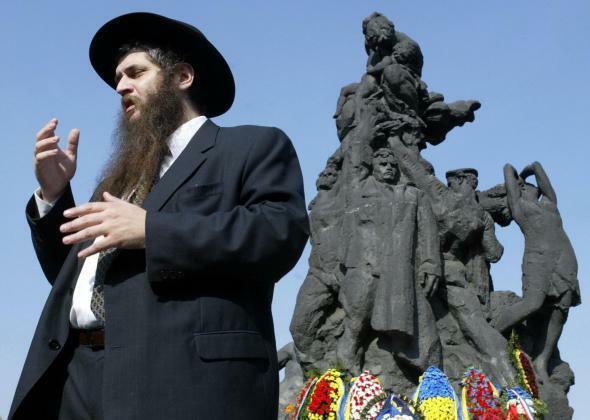 On its own, the ambiguity among Ukraine’s rival rabbis may not be that interesting. But it’s important to keep in mind that Ukraine’s Jewish community isn’t a monolithic bloc. A significant number participated in the Euromaidan movement in Kiev, but there seem to also be a significant number of Jews in Crimea who welcomed the Russian troops. Ukraine’s Jewish community may be small by U.S. or Israeli standards, but by global standards its pretty big—somehwere between 70,000 and 200,000, depending on how you count. It doesn’t seem as though any of these leaders really speaks for all of them. There have been a number of anti-Semitic incidents since the overthrow of Viktor Yanukovych. A synagogue in the Crimean city of Simferopol was defaced. In the midst of the proteststs, there have been at least three beatings of Jews and two vandalism attacks on synagogues. A synagogue was also reportedly attacked in the southeastern city of Zaporozhye, though a number of prominent Jewish leaders accuse Russian nationalists of these attacks. And there are undoubtedly anti-Semitic elements within the movement that now runs the country. On the other hand, the notion put forward by Russia’s foreign ministry and president that Ukraine’s Jews need a Russian military intervention to protect them (complete with invocations of “pogroms”) is laughable. “Who speaks for Ukraine’s Jews?” might be a question open to debate, but the answer is certainly not Vladimir Putin.